Here is an overview of some of the models offered by this supplier. The Omega juicer is a very well established brand of juicers, as Omega have been making juicer machines for over 40 years. The Omega 8003 and 8005 are both masticating juicers the only difference between them is the colour options. Masticating juicers are considered the best way of juicing fruit and vegetables as the slow juicing process leaves the maximum amount of nutrients and enzymes in the juice drink. The central gear allows the fruit and vegetables to move through the machine as the pulp is pushed out of the end. This means there is less chance of the juicer becoming clogged up with excess pulp. It is also handy as the pulp is captured in a separate container and can easily be used for baking. The fruit and vegetables are fed into the juicer by a large chute , not large enough to place whole fruit in without being chopped up but large enough that you don’t have to cut the fruit and veg into tiny sized pieces. Personally I prefer to chop up the fruit and vegetables so that I can remove the core and pips, so this doesn’t bother me. This Omega juicer is easy to assemble and means it’s quick and easy to wash up at the end. Unlike some centrifugal juicers, this masticating juicer does not have a difficult to clean pulp basket. Both of these juicers are sturdy machines that stand still on your worktop when in full use. They also come with a 10-year warranty that proves the manufacturer is confident of its machine. Personally I prefer the look of the 805 model in chrome and black, but that’s just my personal preference. This Omega 8003 and 8005 juicer ticks all the right boxes, as it’s a masticating juicer that’s compact enough to have out on the work top and produces a good healthy juice. Therefore it gets my five star rating, as it’s also quick to set up and clean at the end. 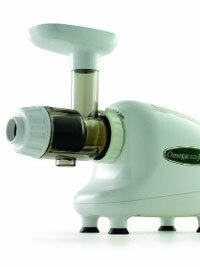 The Omega juicer 1000 is a centrifugal juicer for fresh fruit and vegetables. This is a well designed juicer that is easy to house in an average size kitchen. A great feature of this machine is that the removable stainless steel juicing parts can be washed in a dishwasher. This juicer is easy and quick to put together, it has a good size chute for feeding in pieces of fruit and vegetables. The painted metal casing means it’s a robust and classic looking piece of kitchen equipment. It also has rubber feet, which not only protect your work surface they also allow the juicer to sit securely without jumping around as the pulp basket becomes fuller. This model has a central pulp basket so the pulp stays within the machine. This allows plenty of opportunity for the pulp to have every little bit of juice extracted from it before it’s removed at the end. When it comes to cleaning this juicer, like any centrifugal juicer the Omega juicer is a little more time consuming to clean. However it does have two cleaning advantages. The parts can be removed, rinsed and then washed in the dishwasher. Secondly you can buy a filter for the pulp basket, this allows easier cleaning as the pulp basket is the most difficult part to get clean. By using the filter you also ensure that your juice is totally free of bits. All in all this is a juicer that’s got the benefits of years of Omega manufacturing experience. It’s easy to use and its compact design makes it suitable for all home kitchens. It receives my four star rating. This Omega juicer is perfect for efficiently juicing all types of citrus fruit including oranges, grapefruits, lemons and limes. Like the Omega 1000 this is a well-designed compact juicer. It has a nice look to it with its white exterior and stainless steel juice bowl. This juicer would fit easily into any home. It is fast and efficient at juicing citrus fruit leaving you with the minimum of effort but the maximum amount of fresh fruit juice. The pouring spout at the front of the machine allows the juice to pass out of the juicer allowing you to juice away without overfilling, perfect if you want to prepare juice for all the family. As with any of the Omega range they’ve used their years of experience to design a machine that does the job efficiently and takes no time to assemble or clean, perfect. As a citrus juicer it really is faultless it receives a five star rating. This Omega juicer is similar to the Omega 1000 as it’s a centrifugal juicing machine, but the difference is in the name, this machine extracts the pulp into a separate container. I personally like this as I enjoy baking with the pulp or feeding it to the animals. It comes with a fifteen-year warranty, well that certainly gives you peace of mind, the manufacturers must be confident this juicer is not going to breakdown. The blade and strainer basket are made from stainless steel giving you guaranteed durability. This juicer is suitable for both fruit and vegetables and has a spout at the front where juice is easily caught into your glass or jug. This juicer is well priced for the mid range market with the knowledge and confidence of an established brand behind it. The only fault I can find with it is it only comes in white which personally for me isn’t my favourite colour but that’s a minor issue. I’m giving it a four star rating.